After a bit of trying to install the gem by setting the C_INCLUDE_PATH to the location of the MagickWand.h file, the gem could still not be installed. A Google search revealed the solution. It seems the RMagick gem (v 2.16.0 as of this writing) is not compatible with ImageMagick 7. This installed imagemagick version 6.9.7-4 for me. This solution worked great and RMagick installed without having to jump through any other hoops. Hope this helps. After upgrading my iMac to macOS Sierra I have experienced a few issues that I thought I’d document here, both for myself and to help others. I’ve never seen this one before and with the terminal session hung, I had no real way to debug. Thanks to Stackoverflow, the solution was pretty simple. What I found pointed to the Skylight gem version (0.8.1) I was using. Changing the version 0.10.6, bundling and running the console again fixed the issue. I wondered about the root cause the issue though and did a bit of research to see if I could figure out why this one gem caused such a failure. Knowing what I know about the Skylight gem and being developed at least partially using Rust, I started there. Looking at the Skylight gem source, there is indeed references to using Rust. A bit of spelunking Rust issues revealed there were some issues with earlier macOS Sierra betas. I was using 0.8.1 of the Skylight gem, built before Rust was fixed. One in particular looked very suspect. Everything is working great now. I hope this helps someone with this really odd error. Nokogiri seems to be the source of many problems on my Mac and after upgrading to macOS Sierra, I wasn’t very surprised to have problem. Building Nokogiri with a packaged version of libxml2-2.9.4. Which leads to other less than helpful suggestions. It seems after the macOS upgrade and moving to Xcode 8.0, command line tools were not installed. I hope this helps someone trying to solve a problem that seems should have been solved better by now. I wrote up a list of alternative Ruby web frameworks some time ago and now Engine Yard has published a new list. Some of my original picks are in there, so it’s great to see they’ve continued. A couple notables include Volt, for running Ruby on the server as-well-as the client, and Cramp that helps with needing a lot of open connections and bi-directional communication. A great list to check out. I recently found myself needing to use TinyURL on a client project. ?I did a bit of scouring the web for some Ruby code to solve the problem but with little success. ?Much to my surprise they don’t have an available API, but they do have a way to access over HTTP. 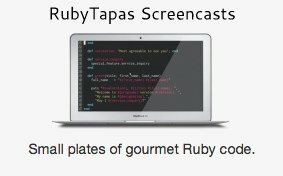 This is a simple Ruby class to use TinyURL. ?Note: this depends on HTTParty, so add to your project. You can find the Gist on Github. Hopefully you find this code useful. Enjoy! I had never had the opportunity to attend Goruco in New York City before, not because I couldn’t make it but rather because I wasn’t fast enough to get a ticket before the conference sold out. ?Now I can understand why it sells out so fast, it is a fantastic conference run by a great group and organized with precision. I decided to make the trip from CT to NYC the same day as the conference and return the evening after it ended, making for a long day indeed. ?Getting up at 3:30 AM seems almost unnatural to drive an hour to meet a friend to make the trip by train from New Haven and arriving at Grand Central Station just after 7:30 AM with my friend and fellow Rubyist, Mike Morris of RecDesk (great software for your recreation department, by the way). 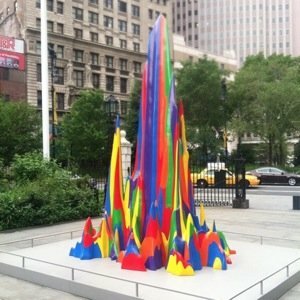 A short trip by subway to lower Manhattan put us at Pace University with plenty of time to settle into the conference. 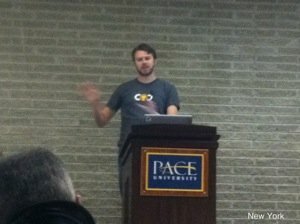 Pace University is the host for Goruco and has been in the past. ?Since it is a university and setup to handle students, it makes a perfect back drop to spending the day talking about Ruby. ?The setting in downtown Manhattan is a great place in a wonderful city. 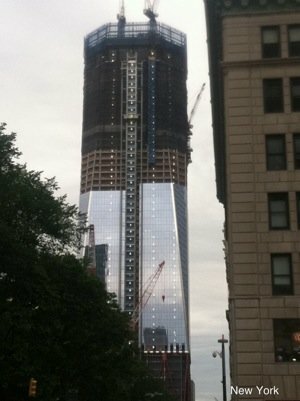 Just a short walk from Pace visitors are treated with the new World Trade Center under construction. Whenever I attend a conference there are always talks that stand out for me, either because the content is great or the topic is something I am working on or interested in at the moment or maybe both. As you can see here, Evan Phoenix waves to the crowd while demonstrating some sleight of hand. There were 7 talks plus RejectConf and of the seven,?Jeremy Ashkenas’s talk titled?Coffeescript for the Well-Rounded Rubyist and?Evan Phoenix’s talk,?Build it and they will come (Rubinius Edition) were the two talks that stood out. ?Jeremy is the creator of?CoffeeScript and Evan the creator of?Rubinius and this fact alone makes their deep knowledge shine through. When a speaker knows a subject as deep as these two, it’s obvious in the delivery and the their ability to answer any question in great detail. 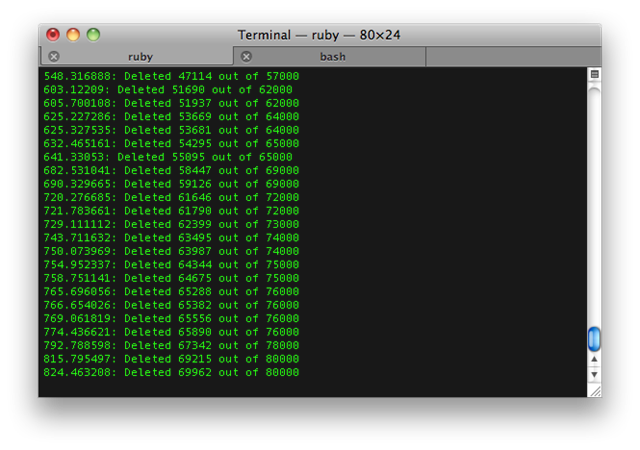 Engine Yard has been 100% committed to Ruby and the development of Rubinius for a long time and this level of commitment has piked my interest over the past several months. 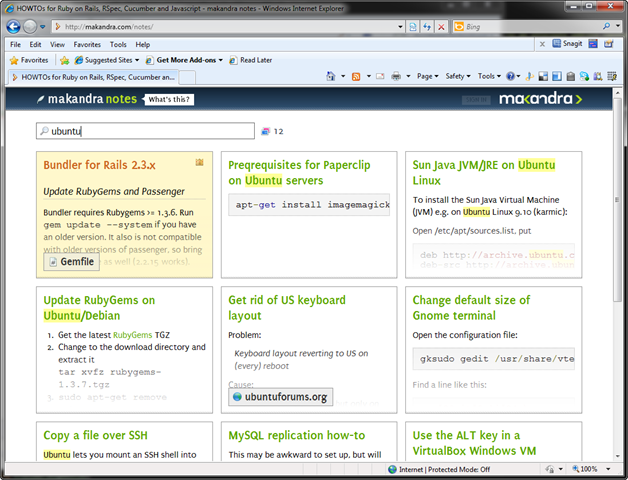 ?I have spend time with Rubinius, testing my applications and using it for new development. ?It has been very stable and performant and I look forward to the day it supports 1.9.x. ?I think once we see version 2.0 will be the time to start moving Rubinius to production. ?So this talk was important to me and Evan did not disappoint. ?He laid out a clear roadmap for the product with a call to action for developers to use it, report bugs and help fix them. The other 5 talks were also really good, along with the end of day lightening talks made for a day of learning. I met up with a lot of folks who I only knew from Twitter, blogs or some other way. ?I always find it interesting to walk around and try to catch a glimpse of people’s name badges to see if they are familiar. ?It’s also interesting to try to match a Twitter avatar to a real face. I am glad for the opportunity to meet these people finally face-to-face. The conference organizers planned for a cruise on the Manhattan water which included dinner and drinks but our lack of planning left us to only watch as others sailed off. ?After a dinner and a couple cold beers we headed back to CT. ?The trip home seemed like a longer journey than our arrival, finally getting in at 2:00 AM. I would have liked to spend the entire weekend in the city and attend all the activities the organizers planned but timing didn’t work out. ?I am sure everyone had a great time. It was a great event covering a great day. ?I plan to be back next year but I will be spending the weekend in the city and hopefully there will be another cruise at Goruco 2012. If I had one suggestion to make to those planning Goruco next time, I wouldn’t mind seeing this as a two-day event full of talks. Whether you’re looking to deliver Paperclip attachments securely, test concurrent Ruby code or marry Capybara with SSL-enabled applications, chances are we already solved your problem for you. The reality is as of this writing, 718 notes are listed. It?s a good resource and one I hope they add to and either let others contribute to or open source the application for others to use to build internal/external knowledge bases. The search is fast too and real-time, narrowing down results as I typed. Way to go Makandra and thanks for the resource. I recently found I problem I needed to solve; remove hundreds of thousands of files from Amazon S3. I mean, it had to be a common problem, right? Well, it certainly be a common problem but the solution was less than common. I tried a few tools available, both the tool from the Amazon S3 site but it keep erroring out and I was never sure why. I then went to third-party tools used for managing S3 buckets but their either errored-out or behaved as if they worked but later determined did nothing. I posted my need on Twitter and was pointed to a solution (thanks @Kishfy) I had not thought of, use Ruby. There is a great open-source project named S3Nukem which its sole purpose is to remove Amazon S3 buckets. This is an open source project hosted on Github. Installation and setup is pretty simple (from the Github repo readme), install required gems. The docs don?t mention it but I needed to install the right_http_connection gem, the above command fails unless it is installed. This is done in the directory where the above curl command was executed from. This script is fast. I tried running this under both Ruby 1.8.7 and 1.9.2 with 1.9.2 quite a bit faster. I didn?t run any benchmarks but it was noticeably faster, my goal was really to just delete large amounts of files. Ruby 1.9.2 thread handling really shines here and with the ability to control the number threads from the command line, is really nice. The nice thing about this script version is the cap on the number of items to be deleted each time, 1000 * thread_count, which defaults to 10. With this limit in place the script won?t chew up all your system memory. This script is designed to delete an entire bucket but could be modified to just remove the content or a directory tree within the bucket. I may do this for a project I am working which has a need for such functionality.